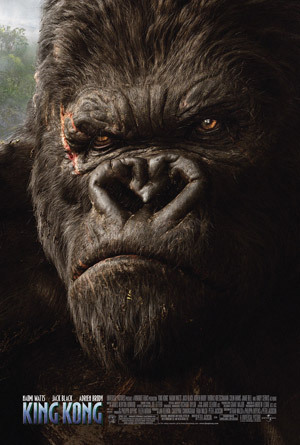 Naomi Watts, Jack Black and Adrien Brody star in director Peter Jackson’s King Kong remake. Watch the movie trailer below. A legendary giant gorilla is captured on a treacherous island and brought to New York to be exhibited, where he breaks loose and runs amok through Manhattan. MPAA Rating: PG-13 for frightening adventure violence and some disturbing images. In 1933 New York, overly ambitious movie producer Carl Denham (Jack Black) coerces his cast and hired ship crew to travel to mysterious Skull Island, where they encounter Kong, a giant gorilla who is immediately smitten with leading lady Ann Darrow (Naomi Watts).